Testing flouride, Treating Fluoride. Fluoride occurs naturally in ground waters throughout the world, and is found in trace amounts in many foods. In many countries, including the U.S., flouride is purposely introduced into drinking water supplies in concentrations of approximately 1.0 ppm (milligrams/liter) for the purpose of reducing dental cavities. EPA has set an enforceable drinking water standard for fluoride of 4 mg/L and a secondary fluoride standard of 2 mg/L to protect against dental fluorosis. Dental fluorosis, in moderate or severe forms, may result in a brown staining and/or pitting of the permanent teeth, though this problem occurs only in developing teeth, before they erupt from the gums. As such, children under nine should not drink water containing more than 2 mg/L of fluoride. The subject of whether to fluoridate public water supplies is a hotly contested and controversial topic. Fluoride can be poisonous at concentrations above 4.0 mg/L, and while dental fluorosis (mottled teeth) is easily recognized, skeletal damage may not be clinically obvious until it reaches an advanced stage, and may be misdiagnosed as rheumatoid or osteo arthritis. Whether or not fluoride causes cancer is also debated, though recent data appears to indicate that it does not. Evidence also shows that dental cavities occur less in areas that have had their water fluoridated, hence U.S. public health officials’ recommended 1.0 ppm fluoride concentration. 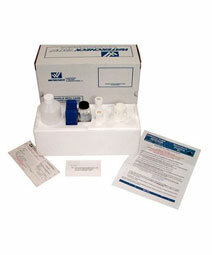 Testing your water for fluoride is easy. You can use a Watercheck test kit or Clean Water test kit to test for fluoride from your own home, or you can send a sample of your water in to a lab for testing. At low levels (<4 ppm) whether or not to remove fluoride from your water is more a matter of preference than a health concern. Water distillers, reverse osmosis systems, or fluoride filters containing activated alumina can be used to reduce fluoride at one tap or in small quantities for drinking. Larger sized fluoride filters are available for whole-house treatment, and for small communities we offer custom systems for specific applications. These systems feature automatic on-site regeneration of the activated alumina media and are basically packaged treatment plants.